Music plays a key role in the life and worship of Holy Trinity. We explore and include a wide variety of musical styles in both our morning and evening services. We aim to make use of the large breadth of music available, by singing traditional hymns, anthems, worship songs, chants and songs from the world church. An adult choir sings an anthem once a month at the Parish Eucharist and also on several special occasions throughout the year; we are always delighted to welcome new singers. You do not need musical expertise, just a love of singing and plenty of enthusiasm! 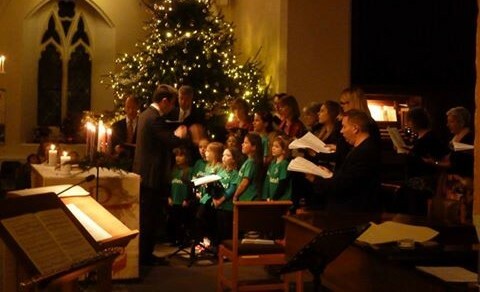 Jubilate, our children's choir, often contributes to our worship as well as putting on other productions. Other musical resources in the church include a three-manual pipe organ built by Henry Jones in 1876/7 – recently fully restored – a Bechstein Grand Piano, and a drum-kit. We like to make appropriate use of all of these at different times. Singing and making music is a wonderful way of bringing people together to express praise and thanks to God, through joy and through sorrow. If you are interested in singing and/or playing an instrument at Holy Trinity please contact our Director of Music, via the contacts page.